I am broke! I don’t have money to buy Photoshop, nor do I know how to use it. I need help with my Images and I don’t know a darn thing about photography! Sounds familiar? Well it should, after all not everyone has a gifted sense of design or the ability to capture a thought provoking or interesting image content to post to FB, Instagram or for that matter, any social media engagement platform. Creating content might sound like making Apple pie but there is always a problem associated with it—either you don’t have time to do it or don’t know where to start. 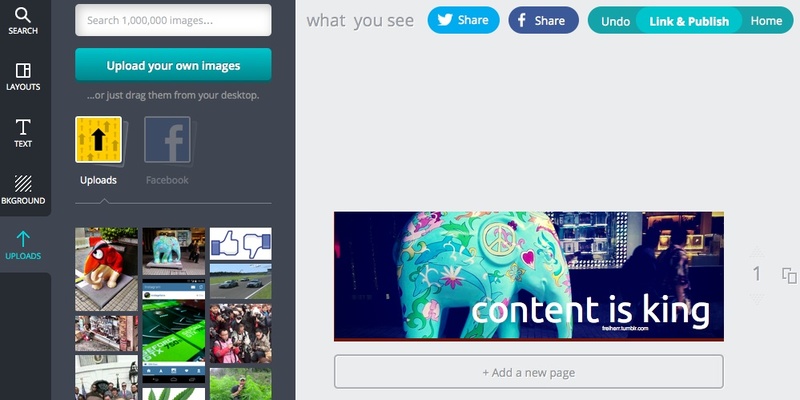 Canva is here to help you but a word or warning, it is still in Beta so do expect some kinks. Photoshop is great, but heck, it’s not easy to use. Then you have the other stuff like illustrator to add in text and graphics, which Photoshop isn’t too useful for. Those are very expensive to purchase so instead of doing that, why not use something simple like Canva? As a digital imaging web app, it does not have the same usability as say, Photoshop Express found on your mobile app. It is a different sort of animal. Previously I had written about Graphic Memes and how some mobile apps can create beautiful content without you ever trying. Canva is similar. But what makes it different is that it can create a whole more lot of stuff for you using purpose designed templates. I have noticed that over time, people tend to get lazy with technology. Optional templates are the way to go for creation enthusiast. No thinking required, and with just just a minimum of design sense you can probably hack something up within five minutes. For a start, you have a slew of pre-selected templates for your Twitter, FB page, business card, poster, etc, etc. You can also design a PDF flyer if you so desire or a call to action brochure for print or web use. I won’t even dare to list the number of things I can think of in which you can design with Canva so let’s stop here. Templates are a boon at least for those who have no design sense. You pick a template, create a graphic for use and drop in the desired images, you then change the text to suit your needs and you’re ready to go. Such simplicity will be a mind blowing experience for many and I am sure even seasoned pros like myself won’t deny how much it helps to solve the problems of creating something out from scratch. The cloud is where your apps will reside one day in a connected world but this is far from perfect. People still prefer to use a PC software like Photoshop instead of using the Cloud based version for one simple reason…your Internet connection is just too slow to upload or download large files. This is probably Canva’s only weakness. I know some of you out there are pretty fond of uploading large pictures and have that scaled down to fit the graphic parameters of your design, and this is probably one of the problems that are being addressed at the moment. Smaller files work perfectly (those under 1MB) but the whole design process will start to crawl on its knees once you start uploading multiples of 5MB photos. During my test, the replacement of the background graphic becomes a problem when manipulating large files. The webapp starts to lag and sometimes it stops working altogether. Besides uploading your preferred files directly up to Canva, you can also pull images from your Facebook account. This is nice, and I hope they would add more image platforms like Google Picasa and Yahoo Flickr. This would make selecting images very easy, but I am not sure if that would be the right intention. 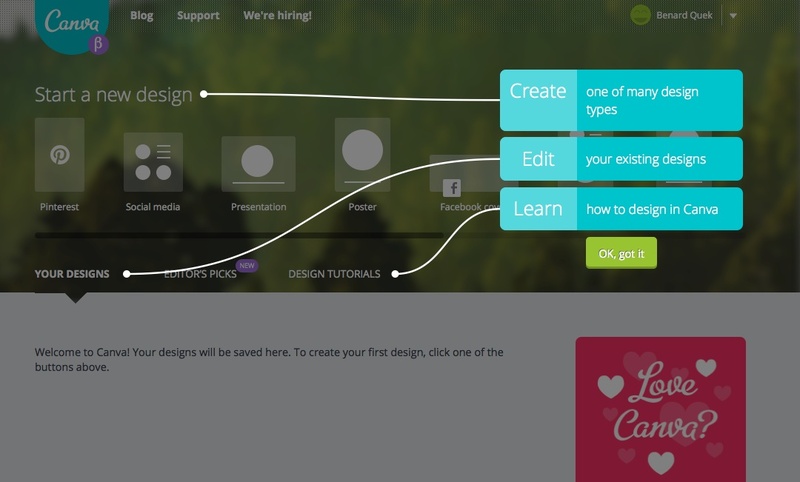 Canva needs to monetize its service by selling stock images and designs. So for every design created that makes use of Canva’s image stock library, they make some money from it. Each image cost only US$1 buck. They don’t obviously make that much in the end, as they have to pay both the stock image library and the photographer who took that picture. That’s one tough business proposition. Presently, Canva only supports Chorme, Firefox and Safari. There is no IE or Opera Support so you gotta switch. Chrome compatibility is relatively poor, at least on the Mac as I have encountered numerous freezes and unresponsive features. Firefox is cool but suffers from lag. That said, Canva is still in Beta and they will need time to sort this out. Canva is ideal for content creation and this is where it gets top marks. The graphic elements, tools and optional images which you can purchase will make this a go to place for all your social media content creation needs. It is fast, effortless and cool. Take for example a poster, you could create one that post to your social media pages. All you need to do is edit the text elements to suit your needs and you’re done. If you have pictures to upload, you can do so as well but you have to make sure it has the right pixel parameters to match for what you want to do. For example, if you are creating a Facebook page background image, you don’t need high resolution images. But if you are going to use it as a Poster, you will need that to fit the requirements. Canva has a lot of potential to succeed but I am not sure they can sort out the problems at the Beta stage right now but there is nothing to stop you from tailoring those beautiful templates to suit your current requirements as long as you’re not too ambitious. Instagram Stalls, Time to get Worried? Is Rufus the Future of Wearables? The mobile device is expected to do more and this isn’t coming on wearables so far, so please welcome the Rufus Cuff…. Walk the Talk. Ripple Buds for mobile phones. If you are thinking of buying a Watch for your mobile device, then you better read this first to know the truth. Gamer, writer, technologist, photographer and philosopher all rolled into one. Benard is an award winning content development specialist who loves cold weather environments and hanging out with strange forest creatures.